The presence of “broken blood vessels,” spider veins, or varicose veins can cause people to feel uncomfortable in their bodies. Fortunately, with the use of sclerotherapy and lasering, we have office procedures that can eliminate or reduce these unsightly veins. Injections typically are the most effective when treating veins on the legs, while facial veins are easily treated with laser. 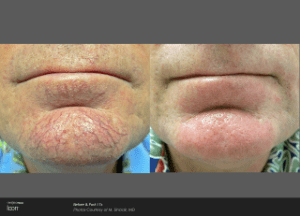 For the face, broken blood vessels and rosacea respond extremely well with our laser, The Icon. Typically, 3-5 treatments are recommended, although many of our patients see noticeable improvement even after their first treatment! We suggest treating the area until you are satisfied with the results and then maintenance treatments to have lasting results. For spider or varicose veins on the legs, sclerotherapy typically is our best treatment option. Unfortunately, raised varicose veins may require specialized treatment, and you may be referred to a vascular surgeon or radiologist with specialized training to deal with these. With sclerotherapy, a small amount of a dilute solution of a compound called Asclera is injected with a very small needle directly into the veins. This is better than using hypertonic saline, as it is less painful and has less risk of prolonged bruising or scarring. The legs will need compression for a few days after this treatment. Normal activities can be resumed soon after the treatment, and side effects are rare. A series of three treatments is usually required.